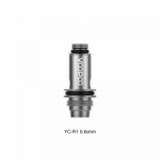 The VOOPOO YC Replacement Coil, a ceramic coil, is compatible with FINIC series kit. So it can produce optimal flavor and massive clouds. Packed 5 pcs in each. The VOOPOO YC Replacement Coil, a ceramic coil, is compatible with FINIC series kit. So it can produce optimal flavor and massive clouds. Packed 5 pcs in each. 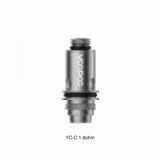 VOOPOO FINIC Fish Kit, VOOPOO FINIC 16 AIO Kit and VOOPOO FINIC 20 AIO Kit is available in BuyBest for you. NOTE：YC-R1 is NOT compatible with FINIC 16 AIO KIT. 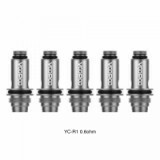 • YC-R1 is NOT compatible with FINIC 16 AIO KIT. • You may need VOOPOO FINIC Fish Kit, VOOPOO FINIC 16 AIO Kit and VOOPOO FINIC 20 AIO Kit. • Other Replacement coils like OBS Draco Coil are also available in ButBest.